Welcome to our South Dublin Pilates, Pilates exercises focus on targeting the deep stabilizing muscles of the spine and abdomen which helps to improve the stability of the spine and lessen the discomfort experienced from back and neck pain. The buttock and shoulder girdle muscles are also targeted which help to improve pelvic and shoulder stability. Pilates also helps to improve posture by helping people to become more aware of their bodies and how they move. It is based on repeating gentle exercises and correcting faulty movement patterns which can, in turn, reduce symptoms. Pilates is beneficial to any age group as a way of managing pain and improving quality of life. At Southside Pilates Clinic, our class sizes are small (Maximum 8) which allows plenty of individual attention. Pilates is taught by a chartered Physiotherapist in Southside Physiotherapy Clinic. If you are looking for Pilates Classes in South Dublin, Then you have come to the right place. We have been providing Pilates in South Dublin for clients living in Blackrock, Booterstown, Bray, Cabinteely, Dalkey, Deansgrange, Dun Laoghaire, Foxrock, Killiney, Leopardstown, Monkstown, Mount Merrion, Sandyford, Shankill, Stepaside and County Wicklow for over two decades. Core Stability refers to the ability of the body to control the trunk or `core´. It involves control of deep stabilising muscles and more superficial global muscles. Good core stability is using the right muscles at the right time at the right intensity to control the trunk appropriately for the task at hand. The muscles of the body are either stabilisers (local) or movement (global) movement muscles. Global muscles are very important for movement of the limbs and trunk. Their job is to move the body. They generate a lot of force, move the body then relax. Work in short bursts rather than staying on as you move. When the deep stabilisers don´t work well to stabilise the spine, the brain recruits the global muscles to compensate. If the body didn´t compensate the spine would be unable to resist the force of gravity and would collapse. Pain around the lower back and pelvis or groin often results from these compensatory strategies. Treating the painful areas only gives short term relief. To treat the pain effectively you need to stop the reason why the compensations occur by improving the deep stabiliser muscles. A local stabilising strategy involves using muscles that attach directly to the spine. The deep stabilising muscles insert directly or via their fascial attachments directly onto the lumbar spine. 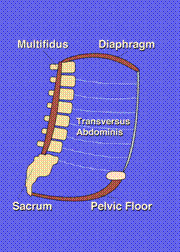 The global muscles in the same area attach from the ribs to the pelvis. The direct connections of the deep stabilising muscles allows them to have a great deal of control over the lumbar spine and pelvis. The more remote connections of the global muscles means they are less able to stabilise the lumbar spine and pelvis. The global muscles can hold the spine rigid and compress it, but can´t give the fine tuned control of the deep stabilisers. Assessing and treating issues with core stability involves assessing both the local and global systems. It is important to find what is underactive, what is overactive and make the muscles function more normally. Generally there is a deficit in the local system that needs to be improved and the subsequent compensatory strategies of the global muscles reduced. It is this reduction in the compensatory strategies that will generally make you feel better. The #1 Source for Pilates Classes in Dublin According to Google!